Topics: Who We Are, What We Do, and Market Research And Intelligence. 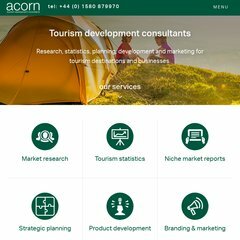 acorntourism.co.uk Acorn provides development options that help Chedham&apos;s Yard win .. The site is programmed for PleskLin. Its 2 nameservers are ns2.rackspace.com, and ns.rackspace.com. It is hosted by Rackspace Managed Hosting England, using Apache web server. PING (83.138.147.91) 56(84) bytes of data.